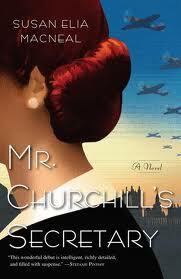 Set right before the London Blitz, the mystery is who shoved the roommate off the balcony in the middle of “lights out?” The spy novel concerns the protagonist’s position in the office of the First Secretary to Winston Churchill – will Maggie unravel the various codes which seem to come her way? The romance is what happened to her father and will Maggie find true love? Although Maggie Hope’s post-grad degree is in math, she’s forced to accept a typist position in the Prime Minister’s Office due to her gender. There’s lots of talk about the war – MacNeal’s research really shows but there was nothing really new – maybe this part is for those who don’t know that some English folks supported Hitler for various reasons (or at least opposed getting involved in a war). The metaphors are clichéd and although that can be comforting in some books, here it simply reflects the stupidity of some characters who should be very bright. Maggie should be bright – she talks about how she loves math, how it’s neat and tidy but when it turns up it feels stilted, show-offy on the part of the author. Various types of coding do come up – the first letters down the left hand side of a page, morse code, basic numeric code – but they’re either pretty simple or MacNeal doesn’t explain. MacNeal is obviously a lit major (heh) – and manages to throw in John Ruskin’s “pathetic fallacy” – a totally literary technique. I almost got involved toward the end – it did get better – the action was not all on the dance floor – I don’t think it ever knew what it was – historical general fiction, crime novel, spy novel, feminist novel or romance featuring a supposedly math-oriented protagonist with a tear-jerky background – a little something for everybody – and not enough for anyone.